On the left bank of the estuary of the river Muga there have been built navigable canals, making use of the original marshlands. The entrance is protected by breakwaters which have also withheld the sand from the sea, forming a 100 meters wide beach in front of the estate itself. The canals stretch for several kilometers and flow in every direction, so that many of the buildings and hotels have a landing stage at their very own door. 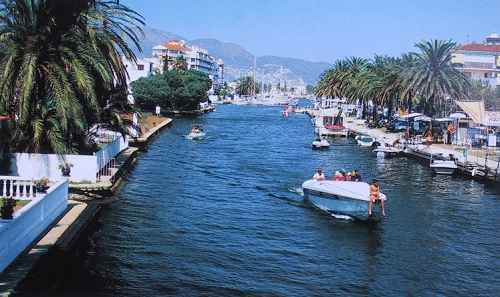 This has made Empuriabrava very popular, both at home and abroad, the tourist population being mainly French, British, Dutch, German, and of course Spanish. The development has several ports for sporting activities, one of which has a large number of moorings where medium-sized boats can anchor. Amongst other facilities there is also a small aerodrome where tourist aeroplanes can land. 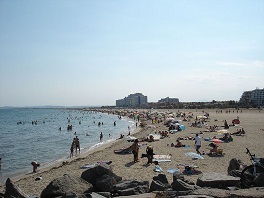 Empuriabrava is on the route from Roses to Figueres and is excellently communicated. Its streets and roads are in a perfect condition as is the magnificent promenade that runs parallel to the beach. This concise tourist sketch has no other intention than to provide a brief panorama of Castella d'Empories. Much has been written at greater depth about the history and characteristics of Castella d'Empories. In any case, it is worth visiting, and after getting to know it you will most likely try to find the opportunity to come back here again.